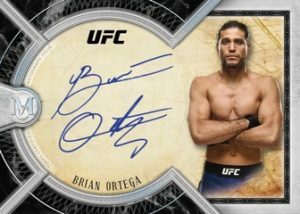 2018 Topps UFC Museum Collection - UFC Card Checklist	Overall rating:	4	out of 5 based on 1	reviews. 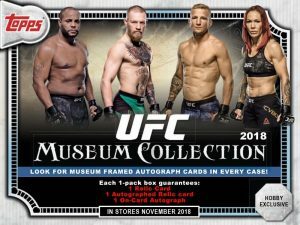 2018 Topps UFC Museum Collection is a premium style release that consists of a single pack per box that offers 3 hits, as well as some base and parallels. The 3 hits will consist of an autographed relic, a regular autograph, and a regular relic. 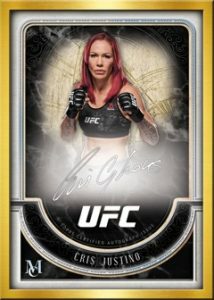 Autographed cards offer many of the top names in the UFC today from both the men’s and women’s divisions. 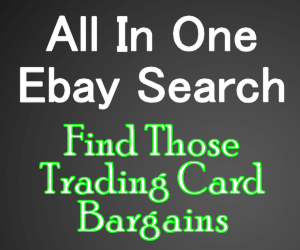 The memorabilia cards offer a variety of different combinations and include some stunning patches. 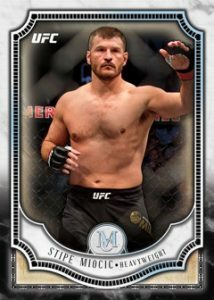 The product isn’t over;y expensive, so, for fans looking to get some UFC trading cards, this would be a good option.